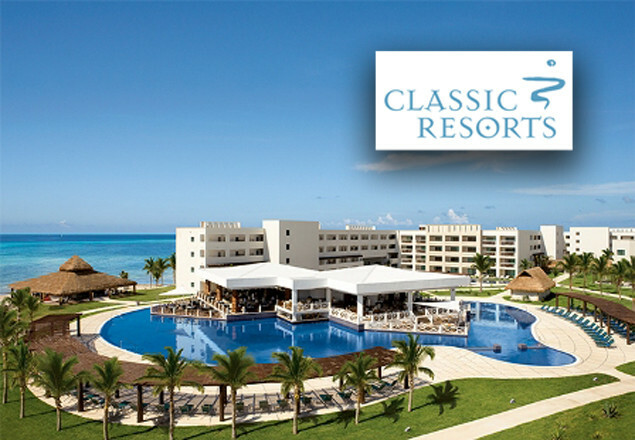 With this week's exclusive Rewarding Times offer, Classic Resorts, an award winning Irish Tour Operator has team up with Virgin Atlantic and the 5* Secrets Silversands Riviera Cancun Resort to offer you a 7 night All Inclusive stay in Mexico. Discover the fascinating world of Mexico. There are several hidden treasures just waiting to be explored. Ancient Aztec pyramids, authentic foods and fantastic shopping. Whether you're looking to visit past civilizations or simply lie on the beach and work on your golf game... Mexico can accommodate. Your journey begins with a connecting flight from Dublin to London where you board the Virgin Atlantic Boeing 747 aircraft. Onboard, settle into your comfy seat with 31in (over 78cm) seat pitch. Tuck into your tasty meal choice and enjoy complimentary drinks. Then relax with over 300 hours of award winning entertainment. On night flights, get some rest with the help of your Relax Pack. On arrival at Cancun Airport, you will transfer to the 5* Secrets Silversands Riveira Cancun takes approximately 20 minutes. Located only 15 miles south of Cancun, this adult only resort is surrounded by vibrant coral reefs, soft white sand and adventurous attractions and features 441 suites, most with stunning ocean views. Guests may dine at any of the 8 exciting gourmet restaurants with no reservations required - or sample premium brand drinks from any of the 8 bars on offer. The world class spa offers both indoor and outdoor treatments and with a wide variety of sightseeing or recreational activities your holiday is set to be as action packed or relaxed as you choose. Your Junior Suite Tropical View room offers either 1 king or 2 double sized beds, whirlpool for 2, ceiling fan, safe, iron & ironing board, hairdryer, 24 hour room service, satellite TV, DVD/CD player, mini bar refreshed daily, coffee maker, internet access, private furnished terrace/patio. The Unlimited-Luxury® All Inclusive includes a Welcome cocktail and cool towel, 24-hour room service, full breakfast, lunch, dinner and snacks, international and domestic premium alcoholic and non alcoholic beverages, mini bar refreshed daily with soft drinks, water and local beer, dance classes, ping-pong, nearby tennis, fitness centre, nightly theme parties & live entertainment. Taxes and gratuities included. *Tour costs not included in holiday price. Date of travel is 20th June for 7 nights on an All Inclusive basis. Prices are based on 2 sharing per person. Single supplements would apply. Resort is for adults only over 18years. Flights from Dublin via Gatwick. No stopover permitted. Full Names must be booked by 12th May 2017 to Classic Resorts. Please call Classic Resorts on 0818332515 or email info@classicresorts.ie with your name and voucher code. 100% Cancellation fee apply after 12th May 2017. Offer is limited to 10 places. Offer is non transferable and no cash refunds. Reservations subject to confirmation from Classic Resorts.